"Black Spider-Man" redirects here. For the black Spider-Man costume, see Venom (Marvel Comics character). For the Logic song, see Black Spiderman. For the Peter Parker Spider-Man, see Spider-Man. Miles Gonzalo Morales (/məˈræləs/) is a fictional comic book superhero appearing in publications by the American publisher Marvel Comics, and one of the characters known as Spider-Man. The character was created in 2011 by writer Brian Michael Bendis and artist Sara Pichelli, with input by Marvel's then-editor-in-chief Axel Alonso. Reaction to the character varied, with some, including Spider-Man's co-creator, Stan Lee, approving the creation of a positive role model for children of color, and others expressing displeasure at the replacement of Peter Parker, with some critics decrying it as a publicity stunt motivated by political correctness, a charge Alonso denied. Alexandra Petri of The Washington Post called for the character to be judged on the quality of its stories, which have garnered positive reviews. The character possesses powers similar to those of the original Spider-Man, which were derived from the bite of a spider genetically engineered by Spider-Man's nemesis Norman Osborn in an attempt to duplicate those abilities. The concept of a black Spider-Man was first discussed a few months before the November 2008 election of Barack Obama as President of the United States. Marvel Comics' then-editor-in-chief Axel Alonso describes the catalyst, "When we were planning 'Ultimatum,' we realized that we were standing at the brink of America electing its first African-American President and we acknowledged that maybe it was time to take a good look at one of our icons." This new Spider-Man would replace Parker as Spider-Man only in Ultimate Marvel, an imprint whose storyline is set in a universe separate from the mainstream Marvel universe, in which Marvel's characters were reimagined for a 21st-century audience. The replacement of Ultimate Peter Parker was considered as a possible part of the 2008–09 "Ultimatum" story arc that restructured much of the Ultimate Marvel universe, but those early thoughts were abandoned because the story for that character had not yet been developed. When Marvel's editorial staff decided that the Ultimate universe's Peter Parker would be killed in the 2011 storyline "Death of Spider-Man", the character Miles Morales was created. Although Morales is the first black Spider-Man, he marks the second time a Latino character has taken the Spider-Man identity. Miguel O'Hara, who is of half-Mexican descent, was the title character in the 1990s series Spider-Man 2099. Miles Morales was created by writer Brian Michael Bendis and artist Sara Pichelli. Bendis's thoughts about the character, and the way he looked in his first appearance, were heavily influenced by African-American actor Donald Glover's appearance in Spider-Man pajamas in "Anthropology 101", the second-season premiere of the television comedy series Community. This was a reference to an unsuccessful online campaign that attempted to secure Glover an audition for the lead role in the 2012 film The Amazing Spider-Man. Bendis said of Glover, "He looked fantastic! I saw him in the costume and thought, 'I would like to read that book.' So I was glad I was writing that book." In creating the visual look for Miles, Pichelli followed her usual practice of approaching the design by giving thought to the character's personality, including the background that influenced it, and the distinctive traits that he would exhibit, such as the clothing he wears, his body language and expressions. Pichelli also designed Spider-Man's new costume, a mostly black outfit with red webbing and a red spider logo. 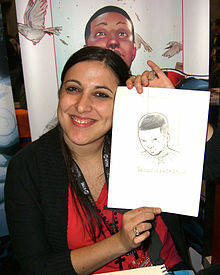 Pichelli had worked on four issues of Ultimate Spider-Man before she was approached to work on the new title with Miles Morales. Pichelli, who works with a Cintiq 12wx graphic tablet, added more screentones to her illustrations to give what she called "a more 'pop' feeling to the book", which she felt would be fitting to the series. Morales was born and raised in Brooklyn, New York City, the then-13-year-old son of an African American father and a Puerto Rican mother. Axel Alonso has described Miles as an intelligent nerd with an aptitude for science similar to his predecessor, Peter Parker. The character made his debut in the fourth issue of the Ultimate Fallout miniseries, which was released on August 3, 2011. He later starred in the relaunched Ultimate Comics: Spider-Man series, written by Bendis and drawn by Pichelli, in September 2011. In contrasting Miles with Peter Parker, Bendis has depicted different conflicts and anxieties for the character. Right after acquiring his superhuman abilities from a spider bite at the home of his uncle, Aaron, whom Miles admires but he does not initially know is a career criminal, Miles' father, Jefferson, explains to Miles that before Miles was born, Jefferson and Aaron were thieves who spent time in prison, and that while Jefferson reformed when he got older, Aaron has not. According to Bendis, this gives Miles cause to wonder if the traits that lead to criminal behavior are hardwired into his DNA, leading him to question whether he is essentially a good person or not, and what his future holds for him. These issues further haunt Miles after he becomes disillusioned with Aaron, and Aaron dies from an accidental explosion triggered during a battle between the two of them, saying, "You are just like me" to Miles before dying. In 2012, Morales appeared in the miniseries Spider-Men, in which he encounters the Spider-Man of the mainstream Marvel universe. In June 2013, the character appeared in the climax of Age of Ultron #10, which was also written by Brian Michael Bendis. Though mostly set in the mainstream Marvel universe, or Earth-616 as it is known in dialogue, the story depicts major changes to the space-time continuum as a result of the time travel on the part of characters, resulting in Miles witnessing the coming of the mainstream Marvel Galactus, an entity that consumes planets, to Earth. Despite its initial press and critical reception, Ultimate Comics Spider-Man was not a huge hit in the direct market. By August 2013, sales on the title had slipped, and sales for the other two Ultimate titles, Ultimate Comics X-Men and Ultimate Comics The Ultimates, had dropped to numbers at which mainstream Marvel titles are cancelled. That November, Ultimate Comics Spider-Man ended its run with issue #28, and the other two titles ended along with it, to make way for the miniseries Cataclysm: Ultimate Spider-Man, one of the books in the crossover storyline "Cataclysm", in which the heroes of the Ultimate universe face the threat of the Earth-616 Galactus, and Miles is transported to the mainstream Marvel universe. Following "Cataclysm", Miles starred in a new title called Miles Morales: Ultimate Spider-Man, again with Bendis as writer, as part of Ultimate Marvel Now, an initiative with which Marvel relaunched the Ultimate Marvel line. Miles Morales was also made a member of the eponymous team in All-New Ultimates, a series written by Michel Fiffe and drawn by Amilcar Pinna. Both series ran for 12 issues. The twelfth and final issue of Miles Morales: Ultimate Spider-Man concluded with a cliffhanger that led directly into the 2015 "Secret Wars" storyline. Marvel ended the Ultimate Marvel imprint with the "Secret Wars" storyline, in which the Marvel Universe was merged with other alternate universes, including the Ultimate Universe. Following "Secret Wars", Miles was made a character of the mainstream Marvel Universe, and a member of the titular team in All-New, All-Different Avengers. He also headlines his third solo series, titled simply Spider-Man, which debuted February 3, 2016, with Bendis and Pichelli returning as the creative team. Pichelli would be succeeded by Nico Leon and Oscar Bazaldua. In the storyline, Peter Parker expands the scope of his activities globally, while the now-16-year-old Miles continues to patrol New York City, and deals with issues such as confrontations with Parker's rogues gallery, the public's reaction to his ethnicity, and his love life. Each issue was numbered sequentially beginning with issue 1, and ending with issue 21, when the numbering switched to legacy numbering, in order to assume an unbroken numbering from 2000's Ultimate Spider-Man #1, with the following issue continuing with issue 234. On November 7, 2017, it was announced that Bendis, having signed an exclusive contract with DC Comics, would be leaving Marvel in early 2018, and Spider-Man cancelled with issue #240 (May 2018). On September 13, 2018, Marvel announced that Saladin Ahmed and Javier Garron would be the writer and artist, respectively on a fourth ongoing solo series, Miles Morales: Spider-Man, the first issue of which was released on December 12, 2018. Miles Morales first appeared in Ultimate Comics: Fallout #4, which was published in August 2011, in which he foils a murder by Kangaroo, a short time after Peter Parker's death. He wears a Spider-Man costume similar to Parker's, but considers changing it when spectators tell him it is in "bad taste". The opening story arc of Ultimate Comics: Spider-Man, which premiered in September 2011, is set prior to Ultimate Fallout #4, and establishes the character of Miles Morales, a grade-schooler who lives with his mother Rio Morales, a nurse, and his father, Jefferson Davis, and details how he received his superhuman abilities. After Oscorp scientist Dr. Conrad Markusa[›] uses Parker's blood to recreate the formula that created Spider-Man, the Prowler (Aaron Davis) steals the formula, and in the process, one of the spiders created by Markus crawls into the Prowler's duffel bag. Days later, the Prowler's nephew, Miles Morales, is bitten by the spider during a visit to Aaron's apartment. Morales develops superhuman abilities similar to those Peter Parker has, but does not tell his parents, due to his father's distrust of superheroes, confiding only in his best friend, Ganke Lee. Miles, who just wants a normal life, is unhappy about having these abilities, and initially nauseated at the idea of risking his life to engage in superheroics, a reaction that Bendis wrote to further contrast Miles with Parker. However, after witnessing Spider-Man's death at the hands of the Green Goblin, the guilt-ridden Miles realizes he could have helped. After Ganke suggests he assume the mantle of Spider-Man, and learns from Gwen Stacy why Parker did what he did, Miles is inspired to try his hand at costumed crimefighting. During his first foray into costumed superheroics, he is confronted not only by those who feel his use of the Spider-Man costume is in bad taste, but also by Spider-Woman, a member of the government superhuman team, the Ultimates, over his use of the Spider-Man identity. Spider-Woman unmasks and arrests Miles and takes him to S.H.I.E.L.D. headquarters, where Nick Fury reveals that he knows all about Miles and his family, including his uncle's criminal activity. After he helps S.H.I.E.L.D. subdue the escaped supervillain Electro, S.H.I.E.L.D. releases Miles and gives him a modified black and red version of the Spider-Man costume, which Ganke feels makes Miles "officially" the new Spider-Man. He also receives the blessing of the Earth-616 Peter Parker during the 2012 Spider-Men miniseries, in which Parker briefly visits the Ultimate Marvel universe and meets Miles. After the newspapers begin reporting the emergence of a new Spider-Man, Aaron deduces that it is really Miles, and offers to train Miles and work with him. After Aaron uses Miles in his ongoing conflict with the Mexican crime lord Scorpion, Miles realizes he is being exploited, and refuses to assist his uncle further, despite Aaron's threat to inform Miles' father of his secret. This leads to an altercation between the uncle and nephew that results in the malfunction of Aaron's weapons, which explode, killing Aaron. In subsequent storylines, Miles becomes acquainted with Peter Parker's loved ones, May Parker, Gwen Stacy and Mary Jane Watson, who know of his secret identity, and give him Parker's web shooters. He also encounters Captain America, who reluctantly agrees to train Miles. In a 2013 storyline, when investigative journalist Betty Brant incorrectly concludes that Miles' father, Jefferson, is the new Spider-Man, she is murdered by Markus, who has become the newest host to the Venom symbiote. In the subsequent "Venom War" storyline, Venom confronts Jefferson at his home, where Spider-Man repels the creature. Jefferson is critically injured and hospitalized in this battle, and when Venom pursues him at the hospital, Spider-Man again confronts him, during which Miles' mother, Rio, also learns that her son is Spider-Man. By the end of the brawl, Markus killed by police gunfire, as is Rio, who tells Miles not to reveal his secret to his father before dying. Miles quits being Spider-Man as a result. A year later he has a girlfriend named Katie Bishop, and is planning on telling her about his former life as Spider-Man. Though he has not engaged in heroics in a year, he is pressured to return to that life by S.H.I.E.L.D. He reluctantly does so, after Ganke and Spider-Woman convince him that there needs to be a Spider-Man. After he and his allies expose the criminal activity of Roxxon executive Donald Roxxon, Miles thanks Ganke for his support, and affirms in earnest that he is Spider-Man. In the "Cataclysm" storyline, the mainstream Marvel Galactus comes to Earth to consume it for its energy. During the course of this story, Miles comes to believe the world is coming to an end, and reveals his double life to his father, who believes he is responsible for the death of Aaron and Rio, and disowns him. Miles also journeys to the mainstream Marvel universe with Reed Richards to acquire information on how to repel Galactus. During the course of his second solo series, Miles Morales: Ultimate Spider-Man, Miles encounters a very much alive Peter Parker, who cannot explain his reappearance, and who does not intend to return to his former life. Together, the two Spider-Men defeat Norman Osborn, who is also revealed to be alive, but who is killed during the course of the story. After witnessing Miles courageously battle Osborn, Peter acknowledges Miles a worthy successor, and decides to retire from superheroics for a life with his family and Mary Jane. Miles' father also reappears, and relates to his son that as a young man, he and Aaron went to work for a criminal named Turk after Jefferson was recruited by S.H.I.E.L.D. as a spy in order to infiltrate the organization of the then-up-and-coming international criminal Wilson Fisk. Jefferson did this for a time, but after the Kingpin was arrested and convicted for his crimes, and Jefferson offered a chance to be a full-fledged S.H.I.E.L.D. agent, he refused, not wanting any part of his brother's world. He met Rio a week later and fell in love with her. Jefferson fled after learning that Miles was Spider-Man because it brought back unresolved issues from that earlier time in his life, and tells Miles that he does not blame Miles for his mother's death, and regrets abandoning him. When Miles reveals his secret identity to his girlfriend, Katie Bishop, she and her parents are revealed to be sleeper agents for the terrorist group Hydra, who then kidnap Miles, his father and Ganke, as part of a plan involving Dr. Doom. Miles and the other prisoners are freed, however, in part with help from Miles' dorm mate, Judge, Maria Hill, and other superhuman colleagues. During the events of the 2015 "Secret Wars" storyline, both the Ultimate Marvel universe and the mainstream Earth-616 universe are destroyed. Miles manages to survive the destruction by infiltrating an escape ship designed by the Cabal. After eight years in stasis, Miles awakens on the planet Battleworld, a new planet created from the remains of the various alternate Earths that had been destroyed. Miles is reunited with Earth-616's Peter Parker and the other surviving 616 heroes, who battle against Doctor Doom, who has used newly acquired powers to appoint himself a God Emperor over the planet. At the conclusion of the storyline, the Molecule Man, in gratitude for Miles' earlier compassion to him, arranges for Earth-616 to be restored, with Miles and his family among its inhabitants, including his mother, who has been restored to life in the process. Miles' uncle, Aaron Davis, is also later revealed to have been restored to life, retaining his knowledge of Miles' dual identity, and assumes the identity of the costumed villain Iron Spider. Both Miles and Peter share the mantle of Spider-Man in the new universe, though the now-16-year-old Miles patrols New York City, while Peter Parker acts globally. 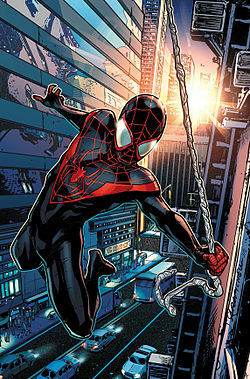 Miles is also a member of the latest team of Avengers, which debuts in the 2016 series All-New, All-Different Avengers, and is being trained by Peter Parker to act as New York's resident spider-themed hero while Parker's work with Parker Industries allows his own activities as Spider-Man to benefit humanity on a global scale. In this new continuity, Miles and his loved ones initially have no memories of their origins in the Ultimate universe, though Miles eventually learns of his past life there, including details such as Rio's "death". Miles' father Jefferson is aware of his double life, but his mother, Rio, is not, nor is S.H.I.E.L.D., though Rio eventually learns the truth. During the series' first year, Miles' circle of fellow superheroes who know of his double identity also expands to include Kamala Khan, the fourth Ms. Marvel, and the former X-Man Fabio Medina, aka Goldballs, who becomes a roommate to him and Ganke at school. This group of confidants later includes the teen superhero Bombshell. His relationship with Katie Bishop apparently did not occur in this continuity, as Miles begins seeing classmate Barbara Rodriguez, whom he calls his "first serious girlfriend", who is unaware of his double life. Miles is a central figure in the 2016–2017 "Civil War II" storyline, in which Ulysses Cain, an Inhuman with precognitive powers, experiences a vision that is interpreted by the superhero community to mean that Miles would kill Steve Rogers, though this scenario does not come to pass. Following "Civil War II", Miles joins other teenage superheroes to form a new incarnation of the Champions, who star in their self-titled series. Bitten by a slightly different genetically engineered spider than the one that granted Peter Parker superhuman powers, Miles Morales possesses abilities similar to the original Spider-Man's, including enhanced strength and agility, the ability to adhere to walls and ceilings with his hands and feet, and a "spider sense" that warns him of danger with a buzzing sensation in his head. Though his strength and agility are similar to those of the original Spider-Man, his spider-sense is not as strong, as it only warns him of immediate danger. He has two abilities that the original Spider-Man does not have: the ability to camouflage himself, including his clothing, to match his surroundings, making him effectively invisible, and a "venom strike" that can temporarily paralyze almost anyone with just a touch. The venom strike does not employ actual venom, but is a type of directed energy that can be conducted through Miles' gloves, and can be used against an opponent at a distance by conducting it through a material in which both Miles and his opponent are in contact, such as the webbing of the Earth-616's Spider-Man. It can break chains being used to restrain Miles and even repel non-ferrous objects, such as plastic Lego bricks. The venom strike is powerful enough to render unconscious a person as large as Hank Pym's Giant-Man. It is powerful enough to drive away the symbiotic villain Venom during Miles' first encounter with the creature, but by their second encounter, Venom has developed such a tolerance to the strike that Miles has to be completely enveloped by the symbiote before the venom strike can separate the symbiote from its host. Doctor Octopus also developed a set of tentacles that would not conduct the venom strike. The effect of the venom strike manifests itself a few seconds after it is implemented, and is described by Bendis as being comparable to the feeling of being kicked in the testicles. Miles can effect a more powerful version of the strike, which he calls a "mega venom blast". When Miles employs this ability, his eyes glow with yellow energy, which then explodes outwards in a radiant burst that can not only repel a large group of opponents, but also destroy thick ropes and chains that have been used to restrain him. This application of the strike leaves him "dizzy and useless", and cannot be used multiple times in rapid succession without a "recharging" period for Miles, though he can still make use of the conventional strike against people during this period. The conventional venom strike is mostly useless against the supervillain Armadillo, but during Miles' encounter with that villain, his venom blast manifests itself in a form similar to Miles' webbing, and Miles uses it like a lasso to pull Armadillo towards him and knock him unconscious with a venom strike-powered punch. Miles' body also possesses a strong resistance to injury. During an altercation with the Roxxon mercenary Taskmaster, Miles is thrown through a brick wall without any apparent serious injury, though the experience is painful for him. Miles wears a costume given to him by S.H.I.E.L.D., and initially uses Peter Parker's web shooters, which are given to him by May Parker. He is eventually given a new set of webshooters by S.H.I.E.L.D. as well. People who say this is a PC stunt miss the point. Miles Morales is a reflection of the culture in which we live. I love the fact that my son Tito will see a Spider-Man swinging through the sky whose last name is "Morales". And judging from the response, I can see I'm not alone. The character Miles Morales was first reported by USA Today on August 2, 2011, shortly before the character officially debuted in Ultimate Fallout #4. The announcement received international coverage in the mainstream media and was met with mixed reactions by audiences. Chris Huntington of The New York Times lauded the creation of Morales, relating that it gave his adopted Ethiopian son Dagim a superhero who looks like him. Some fans and commentators felt the decision was an attempt by Marvel Comics to exhibit political correctness and that the introduction of a minority Spider-Man was simply a publicity stunt to attract more readers, while others felt that a person of color as Spider-Man would set a positive example for minority readers, particularly children. Many Spider-Man fans were disappointed that Peter Parker was killed, regardless of who replaced him. The wide-ranging critical reception prompted The Washington Post to run an article called, "Sorry, Peter Parker. The response to the black Spider-Man shows why we need one", in which writer Alexandra Petri wrote that the character should be judged on the quality of its stories rather than on his appearance or ethnicity. Similarly, conservative talkshow host Glenn Beck, claiming that Miles resembled President Barack Obama, argued that the new Spider-Man was a result of a comment from Michelle Obama about changing traditions. However, Beck said he did not care about Miles' race, and also acknowledged that this was not the mainstream Spider-Man. Axel Alonso denied the character was created out of political correctness, stating "Simple fact is Marvel comics reflect the world in all its shapes, sizes and colors. We believe there's an audience of people out there who is thirsty for a character like Miles Morales." Bendis also denied that the character's ethnicity was an attempt to generate publicity. Original Spider-Man co-creator Stan Lee approved of Miles, stating that "Doing our bit to try to make our nation, and the world, color blind is definitely the right thing." 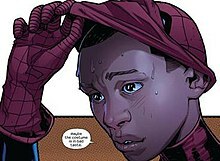 In a review for the first issue, David Pepose of Newsarama wrote, "The biggest victory that Bendis scores with Miles Morales is that he makes us care about him, and care about him quickly. Even though we're still scratching the surface of what makes him tick, we're seeing the world through his eyes, and it's similar to Peter Parker's but a whole lot tougher. But that kind of Parker-style guilt—that neurotic, nearly masochistic tendency for self-sacrifice that comes with great power and greater responsibility—is still intact." Jesse Schedeen of IGN wrote that "Miles still feels like a bit of an outsider in his own book. Bendis never quite paints a complete picture of Miles—his thoughts, motivations, personality quirks, and so forth. Miles is largely a reactionary figure throughout the book as he confronts struggles like registering for a charter school or dealing with family squabbles." Schedeen also opined that "Miles occupies a more urban, racially diverse, and tense landscape. All the story doesn't pander or lean too heavily on elements like racial and economic tension to move forward. Miles is simply a character who speaks to a slightly different teen experience, and one not nearly as well represented in superhero comics as Peter's". James Hunt of CBR.com rated the issue #1 four and a half out of five stars, lauding Bendis for emphasizing Morales' character and his supporting cast instead of rushing him into costume. The first issue holds a score of 8.0 out of 10 at the review aggregator website Comic Book Roundup, based on 13 reviews, while the final issue, #200, holds a score of 8.4, based on 14 reviews, and the series overall holds an average issue rating of 8.3. The second solo series, Miles Morales: Ultimate Spider-Man, has an average issue rating of 8.2 out of 10 at Comic Book Roundup, while the third series, Spider-Man, holds a rating of 7.6, and the most recent series, Miles Morales: Spider-Man, holds a rating of 8.2. In the 2012 miniseries Spider-Men, the mainstream Marvel Universe Peter Parker briefly visits the Ultimate Marvel universe and meets Miles Morales. When Parker returns to his home universe, he does a Google search to see if his universe has a version of Miles Morales, and is shocked by what he finds, but the exact nature of what he finds is left unrevealed to the reader. This is followed up in the 2017 sequel miniseries Spider-Men II, in which the Earth-616 version of Miles Morales makes his first appearance, and is revealed to be a fully-grown adult with a scarred face. The storyline further establishes that this version of Miles became a close friend and confidant to the mob enforcer Wilson Fisk when he saved Fisk's life in prison, an event that resulted in the scars on Miles' face. Miles worked for Fisk following their time in prison, aiding him during Wilson's usurpation of Don Rigoletto's place as crime boss in New York. Years later, after Miles fell in love with a woman named Barbara Sanchez, Fisk arranged to have all traces of Miles' existence erased from searchable records in order help Miles leave his criminal life behind him. Years later, after Barbara died, Fisk informs a grief-stricken Miles that he has knowledge of a parallel universe in which Barbara might still be alive. Miles hires the Taskmaster, who confirms not only that the Ultimate Universe still exists following the events of the "Secret Wars" storyline, but that its version of Barbara is still alive. The adult Miles journeys to the Ultimate Universe to reunite with his lost love, essentially switching places with his younger counterpart. In Deadpool Killustrated #1 (January 2013), Miles Morales' corpse is seen among those of various Spider-Men across various dimensions of the multiverse that an alternate Deadpool has killed. In the 2017 "Sitting in a Tree" storyline that ran in Spider-Man and Spider-Gwen, Miles is transported to Earth-8, where that dimension's versions of him and fellow costumed crimefighter Gwen Stacy have been married for 20 years, and have two children. Miles Morales appears in the 2012 - 2017 animated TV series Ultimate Spider-Man. His name and picture appear in the first season episode "I Am Spider-Man", on a list of understudies for the part of Spider-Man in Phil Coulson's high school play; he is the second to last choice while Peter Parker is the last choice. The third season, titled Ultimate Spider-Man: Web-Warriors, shows various incarnations of Spider-Man, including Miles Morales (voiced initially by Donald Glover). The character would return for the fourth season, titled Ultimate Spider-Man vs The Sinister 6, under the alias Kid Arachnid (now voiced by Ogie Banks). Miles Morales appears in the Marvel Super Hero Adventures episode "That Drone Cat", voiced by Zac Siewert. After battling with Doctor Octopus, Spider-Man and Miles accidentally scare a cat named Mittens, sending her scampering into New York City. As they desperately try to catch the runaway feline, Miles teaches Spider-Man to learn from his mistakes. Miles Morales appears in the animated TV series Spider-Man, which premiered in 2017. He is voiced by Nadji Jeter. He obtains his powers in the episode "Ultimate Spider-Man", in which one of Oscorp's genetically altered spiders bites after he follows classmate Peter Parker, to the scene of an attack upon Osborn Academy by the Spider-Slayer, which leads Peter to mentor Miles in the use of his powers. Writer Brian Michael Bendis stated in 2014 that he favored adapting Miles into a feature film in some way, as did actor Andrew Garfield, who played Spider-Man in The Amazing Spider-Man duology. Producers Avi Arad and Matt Tolmach have indicated in 2014 that they did not intend to have Miles or any other character replace Peter Parker in the role. However, after Marvel brokered a deal with Sony that resulted in the addition of Peter Parker to the films of the Marvel Cinematic Universe (MCU), producer Kevin Feige stated that, while Miles Morales would not be appearing in the MCU for the foreseeable future, he was interested in opportunities to explore the character. In 2017, Feige confirmed that Miles Morales does exist in the MCU, and that Spider-Man: Homecoming alludes to him. In that film, Aaron Davis, played by Donald Glover, mentions to Peter Parker that he has a nephew, who is revealed in a deleted post-credits scene to be named Miles. In 2018 Miles Morales was the main character in Spider-Man: Into the Spider-Verse, the first animated feature film to feature him, in which he is voiced by Shameik Moore. The film enjoyed both box office success and widespread critical acclaim, as well as numerous awards and nominations, among them Academy Award for Best Animated Feature. Miles Morales' Spider-Man suit is available as an alternate costume for Spider-Man in Spider-Man: Edge of Time. The Miles Morales version of Spider-Man appears as an unlockable playable character in Marvel Super Hero Squad Online, voiced by Alimi Ballard. Miles Morales' Spider-Man suit is available as an alternate costume for Spider-Man in The Amazing Spider-Man 2, with the in-game biography stating that the costume was inspired by a comic series in the in-game universe that looks at Miles Morales' life as Spider-Man. The Miles Morales version of Spider-Man appears as an unlockable playable character in Spider-Man Unlimited. The Miles Morales version of Spider-Man appears as an unlockable playable character in Marvel: Avengers Alliance. The Miles Morales version of Spider-Man appears as an unlockable playable character in Marvel Future Fight. The Miles Morales version of Spider-Man appears as an unlockable playable character in Marvel Puzzle Quest. The Miles Morales version of Spider-Man appears as an unlockable playable character in Marvel Contest of Champions. The Miles Morales version of Spider-Man appears as an unlockable playable character in Marvel: Avengers Alliance 2. The Miles Morales version of Spider-Man appears as a playable character in the "Spider-Man" DLC pack for Lego Marvel's Avengers. The Miles Morales version of Spider-Man appears as an unlockable playable character in Marvel Avengers Academy, voiced by Brandon Winckler. The Miles Morales version of Spider-Man appears as an unlockable Team-Up character in Marvel Heroes, voiced again by Ogie Banks. The Miles Morales version of Spider-Man appears as an unlockable playable character in Lego Marvel Super Heroes 2. Miles Morales appears in Spider-Man, with Nadji Jeter reprising his role. A pre-spider bite Miles is playable at certain points in the game with an emphasis on stealth gameplay. He is eventually bitten by an experimental Oscorp spider, and in a post-credits scene, reveals his powers to Peter, who in turn reveals being Spider-Man. The Miles Morales version of Spider-Man appears as a playable character in Marvel Ultimate Alliance 3: The Black Order. Miles Morales is the main character of the 2017 novel Miles Morales: Spider-Man, written by Jason Reynolds. In March 2018, Sideshow Collectibles debuted a Miles Morales Premium Format Figure, a 17"-tall polystone statue depicting Morales jumping over the gaping jaws of the Venom symbiote. The statue features two removal heads, with and without the mask, and an extra hand holding the mask. At its debut the statue was priced at $520. ^ a: Markus is established as simply "Dr. Markus" in Ultimate Comics: Spider-Man #1 (November 2011), and his given name is established in Ultimate Comics: Spider-Man #22 (June 2013), though his surname is misspelled "Marcus" in that issue. In a private email, Bendis stated that the first spelling is the correct one. ^ a b Salvatore, Brian (December 6, 2018). "Exclusive Preview: “Miles Morales Spider-Man” #1". Multiversity Comics. Retrieved December 7, 2018. ^ a b c Ahmed, Saladin (w), Garrón, Javier (a). Miles Morales: Spider-Man #1 (2018) Marvel Comics (New York). ^ Gage, Christos (w), Barberi, Carlo G.; Caselli, Stefano; Molina, Jorge; Vazquez, Joey (p), Caselli, Stefano; Leisten, Jay; Marzan, Jose Jr.; Vazquez, Joey (i). Spider-Geddon #5 (2018). Marvel Comics (New York). ^ a b Truitt, Brian (August 2, 2011). "Half-black, half-Dominican Spider-Man revealed". USA Today. Archived from the original on August 20, 2011. ^ Babos, John (August 6, 2011). "Marvel's New Ultimate Spider-Man Miles Morales: A Significant And Safe Leap Forward". Comics Nexus. ^ a b c Petri, Alexandra (August 3, 2011). "Sorry, Peter Parker. The response to the black Spiderman shows why we need one". The Washington Post. Archived from the original on August 20, 2011. Retrieved August 20, 2011. ^ a b c d e f "Axel Alonso: Reinventing Today's Heroes". LatinRapper.com. August 8, 2011. Archived from the original on August 17, 2011. Retrieved August 17, 2011. ^ a b c d Truitt, Brian (August 2, 2011). "A TV comedy assured new Spidey's creator". USA Today. Archived from the original on August 20, 2011. Retrieved August 19, 2011. ^ a b c d Robinson, Bryan (August 16, 2011). "Remembering the First – and Forgotten – Latino Spider-Man". Fox News Latino. Archived from the original on August 20, 2011. Retrieved August 19, 2011. ^ a b Cavna, Michael (August 16, 2011). "Miles Morales: Check out Sara Pichelli inking the new Ultimate Spider-Man". The Washington Post. Archived from the original on August 17, 2011. Retrieved August 17, 2011. ^ Weiland, Jonah (October 23, 2013). "CBR TV: Sara Pichelli on Designing Miles Morales & Being a Rising Star". CBR.com. ^ a b Richards, Ron (August 16, 2011). "Exclusive: Ultimate Spider-Man Interview with Sara Pichelli with Video!". iFanboy. Archived from the original on August 17, 2011. Retrieved August 17, 2011. ^ a b c Towers, Andrea (February 1, 2016). "See a sneak peek inside Spider-Man #1". Entertainment Weekly. ^ a b Sacks, Ethan (June 21, 2015). "EXCLUSIVE: Spider-Man Miles Morales — popular biracial version of the hero — joins main Marvel comics universe this fall". Daily News (New York). ^ a b Ching, Albert (August 2, 2011). "Identity of the New Ultimate Spider-Man". Newsarama. Archived from the original on August 19, 2011. Retrieved August 18, 2011. ^ a b c d Wheeler, Andrew (August 15, 2013). "The Crossover: Should Ultimate Spider-Man Miles Morales Move to the Marvel Universe? (Opinion)". Comics Alliance. Archived from the original on November 3, 2013. ^ a b c d e Richards, Dave (September 30, 2011). "COMMENTARY TRACK: Bendis on "Ultimate Comics Spider-Man" #2". CBR.com. ^ Bendis, Brian Michael (w), Pacheco, Carlos (p), Bonet, Roger (i). Age of Ultron #10 (August 2013), Marvel Comics. ^ a b Johnston, Rich (August 15, 2013). "All Ultimate Titles Cancelled In November And Replaced With Cataclysm… And Miles Morales Is Headed To The Marvel Universe". Bleeding Cool. ^ Hughes, Joseph (January 10, 2014). "Marvel To Relaunch The Ultimate Universe With Three New Series From Bendis, Marquez, Fialkov, Fiffe And More" Archived 2014-01-11 at the Wayback Machine. Comics Alliance. ^ Siegel, Lucas (January 10, 2014). "Update: More All-New ULTIMATE NOW! Details, Covers Emerge". Newsarama. ^ Schedeen, Jesse (April 9, 2015). "Comic Book Reviews for April 8, 2015". IGN. ^ a b Schedeen, Jesse (January 14, 2015). "All-New Ultimates #12 Review". IGN. ^ Babos, John (November 10, 2014). "Time Runs Out For All-New Marvel Now With 2015's Secret Wars & 13 Redux With Civil War, Infinity Gauntlet, Avengers Vs X-Men, Age of Ultron & More Spoilers For A Multiverse's Reboot Or Convergence?". Comics Nexus. ^ McMillan, Graeme (November 25, 2014). "Marvel Unveils 'Battleworld' Map Ahead of 2015's 'Secret Wars'". The Hollywood Reporter. ^ Brevoort, Tom (December 26, 2014). "Untitled". New Brevoort Formspring/Tumblr. ^ McMillan, Graeme (January 28, 2015). "'Ultimate End' Closes a 15-Year Era of Marvel's Comic History". The Hollywood Reporter. ^ Kamen, Matt (March 6, 2015). "Exclusive: Marvel's first post-Secret Wars titles revealed". Wired. ^ a b c d "Spider-Man (2016)". Comic Book Roundup. Retrieved September 24, 2018. ^ Davison, Joshua (March 20, 2018). "'Falcon' and Miles Morales' 'Spider-Man' Cancelled in June". Bleeding Cool. ^ Schedeen, Jesse (September 13, 2018). "Spider-Man Miles Morales Returns in New Marvel Series". IGN. Retrieved September 25, 2018. ^ a b c Schedeen, Jesse (August 3, 2011). "Ultimate Comics: Fallout #4 Review". IGN. Archived from the original on August 20, 2011. Retrieved August 20, 2011. ^ "This Week In Geek: Different Shades of Spider-Man". The Salt Lake Tribune. August 16, 2011. Archived from the original on August 20, 2011. Retrieved August 20, 2011. ^ a b Bendis, Brian Michael (w), Marquez, David (p), Ponsor, Justin (i). Ultimate Comics: Spider-Man 18 (February 2013), Marvel Comics NOTE: Although Rio's given name was first given by the editor on the letters page of issue #8, both it and Ganke's surname were first issued in the narrative in issue #18. ^ Bendis, Brian Michael (w), Bazaldua, Oscar (a). Spider-Man #234 (January 2018). Marvel Comics. ^ Slott, Dan; Gage, Christos (w), Camuncoli, Giuseppe (p), Smith, Cam (i). "Power Play Part 3: 'Avengers Assembled'", The Amazing Spider-Man (Vol. 4) #14 (August 2016). Marvel Comics. ^ Hastings, Christopher (w), Strychalski, Irene (a). The Unbelievable Gwenpool #6 (November 2016). Marvel Comics. ^ a b c Bendis, Brian Michael (w), Pichelli, Sara (a). "Part One". Spider-Men II #1 (September 2017). Marvel Comics. ^ Bendis, Brian Michael (w), Pichelli, Sara (p), Carlucci, Gaetano; Pichelli, Sara (i). Spider-Man (Vol. 2) #2 (May 2016). Marvel Comics. ^ Bendis, Brian Michael (w), Pichelli, Sara (a). Spider-Man (Vol. 2) #12 (March 2017). Marvel Comics. ^ Bendis, Brian Michael (w), Kudranski, Szymon (a). Spider-Man (Vol. 2) #15 (June 2017). Marvel Comics. ^ Bendis, Brian Michael (w), Pichelli, Sara (p), Carlucci, Gaetano; Pichelli, Sara (i). Spider-Man (Vol. 2) #3 (June 2016). Marvel Comics. ^ Bendis, Brian Michael (w); Pichelli, Sara (p); Carlucci, Gaetano; Pichelli, Sara (i). Spider-Man (Vol. 2) #4–5 (July – August 2016). Marvel Comics. ^ Bendis, Brian Michael (w), Various (a). Spider-Men II #1, 2, 4 (September 2017 – January 2018); Spider-Man (Vol 2) #234 (January 2018). Marvel Comics. ^ Waid, Mark (w), Ramos, Humberto (p), Olazaba, Victor (i). Champions (Vol. 2) #1 (December 2016). Marvel Comics. ^ Bendis, Brian Michael (w), Pichelli, Sara (a). "Venom War", Part 2. Ultimate Comics: Spider-Man #20. April 2013. Marvel Comics. ^ Bendis, Brian Michael (w), Pichelli, Sara (a). "Venom War", Part 4. Ultimate Comics: Spider-Man #22 (June 2013). Marvel Comics. ^ Bendis, Brian Michael (w), Leon, Nico (a). Spider-Man (Vol. 2) #21 (December 2017). Marvel Comics. ^ Huntington, Chris (June 13, 2013). "A Superhero Who Looks Like My Son". The New York Times. ^ Graupman, Michael (August 4, 2011). "Publicity stunt or long overdue? New Spider-Man swaps skin color in latest Marvel comic book". Culture Map Houston. Retrieved December 24,2 018. ^ Rose, Steve (December 7, 2018). "Move over, Peter Parker – the new Spider-Man ushers in a bold superhero era". The Guardian. Retrieved December 24, 2018. ^ Hudson, Laura (August 4, 2011). "Drudge Report Thinks New Spider-Man 'Could Be Gay,' Glenn Beck (and Colbert) Protest Diversity". ComicsAlliance. Archived from the original on March 19, 2012. ^ Franich, Darren (August 2, 2011). "New Spider-Man is a half-black half-Hispanic teenager". Entertainment Weekly. Retrieved December 24, 2018. ^ Sacks, Ethan (April 11, 2012). "Marvel Comics brings together its two special versions of 'Spider-Man' in special summer miniseries event". Daily News. New York. ^ Hunt, James (September 14, 2011). "Ultimate Comics Spider-Man #1". CBR.com. ^ "Ultimate Comics Spider-Man Vol. 2" Archived May 5, 2014, at the Wayback Machine. Comic Book Roundup. Retrieved September 24, 2018. ^ "Miles Morales: Ultimate Spider-Man" Archived March 21, 2015, at the Wayback Machine. Comic Book Roundup. Retrieved September 24, 2018. ^ Miles Morales: Spider-Man. Comic Book Roundup. Retrieved December 30, 2018. ^ Schedeen, Jesse (July 12, 2017). "Spider-Men II #1 Review". IGN. ^ Johnson, Jim (July 13, 2017). "Spider-Men II #1 Reveals the ‘Other’ Miles Morales, But Who Is He?" CBR.com. ^ Nolan, Liam (August 16, 2017). "Spider-Men II #2 Review". AIPT! ^ Bendis, Brian Michael (w), Pichelli, Sara (a). "Part Two". Spider-Men II #2 (August 2017). Marvel Comics. ^ Giovannini, Tara. (September 21, 2017). "Comic Book Reviews for September 20, 2017: Page 2 Of 3". IGN. ^ Lainez, Kevin (September 24, 2017). "Spider-Men II #3 Review". Comic Book Revolution. ^ Couto, Anthony (September 11, 2017). "Kingpin Gives His Condolences in Spider-Men II #4 Preview". CBR.com. ^ Glass, Joe (December 27, 2017). "A Major Unexpected Return in Today’s Spider-Men II #5". Bleeding Cool. ^ Bendis, Brian Michael (w); Pichelli, Sara (a). "Sitting in a Tree Part 5", Spider-Man (Vol. 2) #14 (May 2017). Marvel Comics (New York). ^ Pepose, David (March 28, 2017). "Best Shots Reviews: SPIDER-GWEN #18, HAL JORDAN & GREEN LANTERN CORPS #17". Newsarama. ^ a b Truitt, Brian (August 26, 2014). "Spider-Man 'can be anybody' — and now he's Donald Glover". USA Today. Retrieved August 26, 2014. ^ Sunu, Steve (May 9, 2014). "What is 'Ultimate Spider-Man: Web-Warriors'?" CBR.com. ^ Melrose, Kevin (August 26, 2014). "Donald Glover Cast as Disney's Ultimate Spider-Man". CBR.com. ^ Mendelson, Scott (June 3, 2015). "Disney's 'Avengers' Cartoons Introduce Kids To Marvel's Phase 3 Movie Heroes (And Ms. Marvel)". Forbes. ^ "Spidey & Miles Aren't Kitten Around! - Marvel Super Hero Adventures - That Drone Cat - SHORT". YouTube. October 10, 2018. ^ Rey, Leo (December 18, 2016). "SPIDER-MAN 2017 CARTOON WILL FEATURE VENOM, SPIDER-GWEN, AND MILES MORALES". Nerdspan. ^ Rubin, Rebecca (July 14, 2017). "'Marvel's Spider-Man’ Disney XD Series Rounds Out Cast, Gets Premiere Date". Variety. ^ Trumbore, Dave (September 22, 2017). "'Marvel's Spider-Man': Nadji Jeter on Bringing Miles Morales into the Spotlight". Collider. ^ Riesman, Abraham (May 1, 2014). "Comics Legend Brian Michael Bendis on Sexism and Making a Nonwhite Spider-Man". Vulture. ^ Fowler, Matt (April 30, 2014). "Andrew Garfield Talks Miles Morales Taking Over as Spider-Man". IGN. ^ Wigler, Josh (April 28, 2014). "Andrew Garfield On "The Amazing Spider-Man's" 'Ultimate' Potential". CBR.com. ^ Taylor, Drew (April 30, 2014). "Interview: 'Amazing Spider-Man 2' Producers Avi Arad & Matt Tolmach Talk Spin-Off Plans, Crossovers & More". India Wire. ^ Jagernauth, Kevin (April 13, 2015). "Kevin Feige Says Miles Morales Won't Be In MCU For Now, Says Spider-Man Costume Is Ready". Indiewire. Archived from the original on 2015-07-26. Retrieved 2015-07-31. ^ Siegel, Lucas (September 27, 2017). "Spider-Man: Homecoming deleted scene finally name-checks Miles Morales in MCU". SyFy Wire. ^ Paul, Andrew (September 26, 2017). "Spider-Man: Homecoming Deleted Scene Includes Miles Morales Easter Egg". CBR.com. ^ Kit, Borys (April 13, 2017). "Animated Spider-Man Film Finds Its Miles Morales (Exclusive)". The Hollywood Reporter. ^ "Spider-Man: Into the Spider-Verse (2018)". Box Office Mojo. IMDb. Retrieved January 23, 2019. ^ D'Alessandro, Anthony (December 11, 2018). "Look Out, Here Comes 'The Spider-Verse': Sony Animation Title Eyes $30M-$35M Opening – Box Office Preview". Deadline Hollywood. Archived from the original on December 11, 2018. Retrieved December 11, 2018. ^ "Spider-Man: Into the Spider-Verse (2018)". Rotten Tomatoes. Fandango. Archived from the original on November 29, 2018. Retrieved January 15, 2019. ^ "Spider-Man: Into the Spider-Verse Reviews". Metacritic. Archived from the original on December 20, 2018. Retrieved January 4, 2019. ^ D'Alessandro, Anthony (December 16, 2018). "'Spider-Verse' Raises $35M+ As 'The Mule' Kicks Up $17M+ In Pre-Christmas Period, But 'Mortal Engines' Breaks Down With $7M+". Deadline Hollywood. Archived from the original on December 15, 2018. Retrieved December 16, 2018. ^ "'Roma,' 'The Americans' and 'The Marvelous Mrs. Maisel' Win Top Critics' Choice Honors". Variety. January 13, 2019. Archived from the original on January 14, 2019. Retrieved January 14, 2019. ^ McNary, Dave (February 24, 2019). "Oscars: ‘Spider-Man: Into the Spider-Verse’ Wins Best Animated Feature". Variety. Retrieved March 14, 2019. ^ Reeves, Ben (September 14, 2011). "Spider-Man: Edge of Time Slips Into Ultimate Spidey's Costume". Game Informer. ^ "Ultimate Comics Spider-Man Enters SHSO". Marvel.com. September 14, 2011. Archived from the original on February 10, 2012. ^ Tylwalk, Nick (2015). "Miles Morales Swings Into Spider-Man Unlimited". Fansided. Retrieved December 14, 2018. ^ (Untitled). Marvel Entertainment/Facebook. June 2, 2015. Retrieved December 14, 2018. ^ Stewart, Marcus (16 December 2015). "Big Marvel Future Fight Update Headlined By A Trio Of Spider-Men". Game Informer. Retrieved 26 August 2016. ^ Parungo, Nicolo (January 11, 2016). "'Ultimate' Spider-Man Miles Morales has entered 'Marvel Contest of Champions'". International Business Times. Retrieved December 14, 2018. ^ Keating, Lauren (March 31, 2016). "Disney Interactive Launches 'Marvel: Avengers Alliance 2,' A Unique Story With Ties To The Marvel Universe". Tech Times. Retrieved December 14, 2018. ^ Phillips, Tom (May 24, 2016). "Spider-Man swings free in Lego Marvel's Avengers today". Eurogamer. Retrieved December 14, 2018. ^ Winckler, Brandon [@BWincklerVA] (July 27, 2016). "Awesome news! I'll be voicing Ultimate Spider-Man Miles Morales, in Marvel Avengers Academy! I also voice Green Goblin! #games #ios #android" (Tweet). Retrieved February 25, 2018 – via Twitter. ^ Intihar, Bryan (October 30, 2017). "Marvel's Spider-Man: New Trailer Features Aunt May, MJ & More". PlayStation Blog. Retrieved November 4, 2017. ^ Insomniac Games (September 7, 2018). Spider-Man (2018 video game). PlayStation 4. Sony Interactive Entertainment. ^ Johnston, Rich (July 23, 2016). "Jason Reynolds To Write A Miles Morales Spider-Man Young Adult Novel". Bleeding Cool. ^ Herviou, Nicole (May 20, 2017). "Check out this exclusive art for the new Spider-Man novel". Mashable. ^ Konrad, Jeremy (March 21, 2018). "Miles Morales Premium Format Figure on Its Way from Sideshow". Bleeding Cool. Jennings, Jackie (August 8, 2017). "Ultimate Spider-Man in 2 Minutes". Syfy Wire.